The previous chapter introduced the key concepts of Android Jetpack and outlined the basics of modern Android app architecture. Jetpack essentially defines a set of recommendations describing how an Android app project should be structured while providing a set of libraries and components that make it easier to conform with these guidelines with the goal of developing reliable apps with less coding and fewer errors. To help re-enforce and clarify the information provided in the previous chapter, this chapter will step through the creation of an example app project that makes use of the ViewModel component. This example will be further enhanced in the next chapter with the inclusion of LiveData and data binding support. 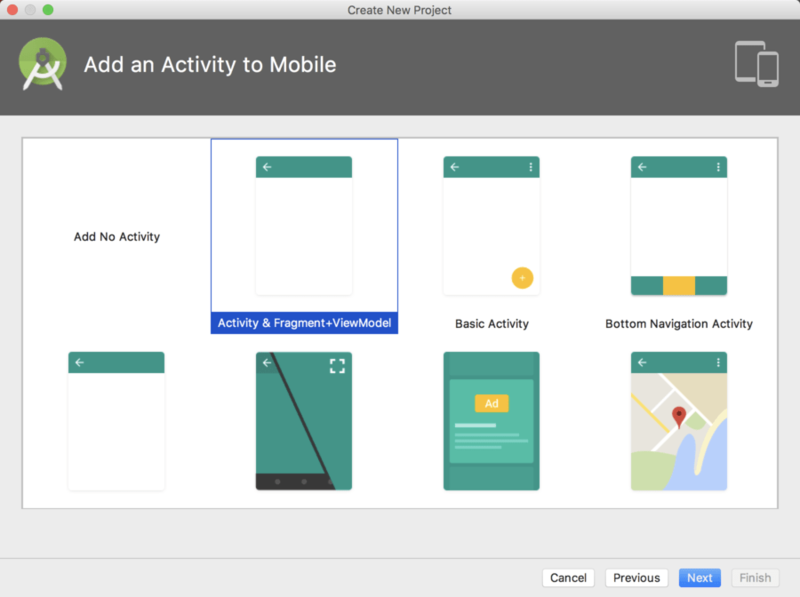 In the chapter entitled Creating an Example Java Android App in Android Studio, a project named AndroidSample was created in which all of the code for the app was bundled into the main Activity class file. In the chapter that followed, an AVD emulator was created and used to run the app. While the app was running, we experienced first-hand the kind of problems that occur when developing apps in this way when the data displayed on a TextView widget was lost during a device rotation. This chapter will implement the same currency converter app, this time using the ViewModel component and following the Google app architecture guidelines to avoid Activity lifecycle complications. Select the Start a new Android Studio project quick start option from the welcome screen and, within the resulting new project dialog, enter ViewModelDemo into the Application name field and ebookfrenzy.com as the Company Domain setting before clicking on the Next button. On the form factors screen, enable the Phone and Tablet option and set the minimum SDK setting to API 26: Android 8.0 (Oreo) before proceeding to the Activity selection screen. On the final setup screen, accept the default file names and create the project using the Finish button. 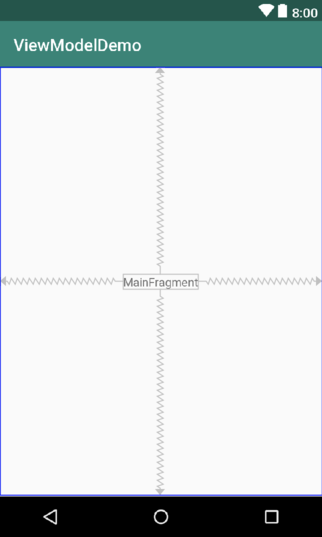 By default, the fragment simply contains a TextView displaying text which reads “MainFragment” but is otherwise ready to be modified to contain the layout of the first app screen. 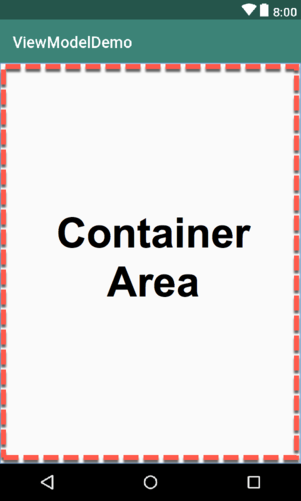 It is worth taking some time at this point to look at the code that has already been generated by Android Studio to display this fragment within the activity container area. The next step is to design the layout of the fragment. Locate the main_fragment.xml file in the Project tool window and double click on it to load it into the layout editor. Once the layout has loaded, select the existing TextView widget and use the Attributes tool window to change the id property to resultText. Drag a Number (Decimal) view from the palette and position it above the existing TextView. With the view selected in the layout refer to the Attributes tool window and change the id to dollarText. ﻿Finally, click on the warning icon in the top right-hand corner of the layout editor and convert the hardcoded strings to resources. The class declares variables to store the current dollar string value and the converted amount together with getter and setter methods to provide access to those data values. When called, the setAmount() method takes as an argument the current dollar amount and stores it in the local dollarText variable. The dollar string value is converted to a floating point number, multiplied by a fictitious exchange rate and the resulting euro value stored in the result variable. The getResult() method, on the other hand, simply returns the current value assigned to the result variable. Clearly, there needs to be some way for the fragment to obtain a reference to the ﻿ViewModel in order to be able to access the model and observe data changes. A Fragment or Activity maintains references to the ViewModels on which it relies for data using an instance of the ViewModelProvider class. With access to the model view, code can now be added to the Fragment to begin working with the data model. With the listener added, any code placed within the onClick() method will be called whenever the button is clicked by the user. When the button is clicked, the onClick() method needs to read the current value from the EditText view, confirm that the field is not empty and then call the setAmount() method of the ViewModel instance. The method will then need to call the ViewModel’s getResult() method and display the converted value on the TextView widget. Since LiveData is not yet being used in the project, it will also be necessary to get the latest result value from the ViewModel each time the Fragment is created. With this phase of the project development completed, build and run the app on the simulator or a physical device, enter a dollar value and click on the Convert button. The converted amount should appear on the TextView indicating that the UI controller and ViewModel re-structuring appears to be working as expected. When the original AndroidSample app was run, rotating the device caused the value displayed on the resultText TextView widget to be lost. Repeat this test now with the ViewModelDemo app and note that the current euro value is retained after the rotation. This is because the ViewModel remained in memory as the Fragment was destroyed and recreated and code was added to the onActivityCreated() method to update the TextView with the result data value from the ViewModel each time the Fragment re-started. While this is an improvement on the original AndroidSample app, there is much more that can be achieved to simplify the project by making use of LiveData and data binding, both of which are the topics of the next chapter. 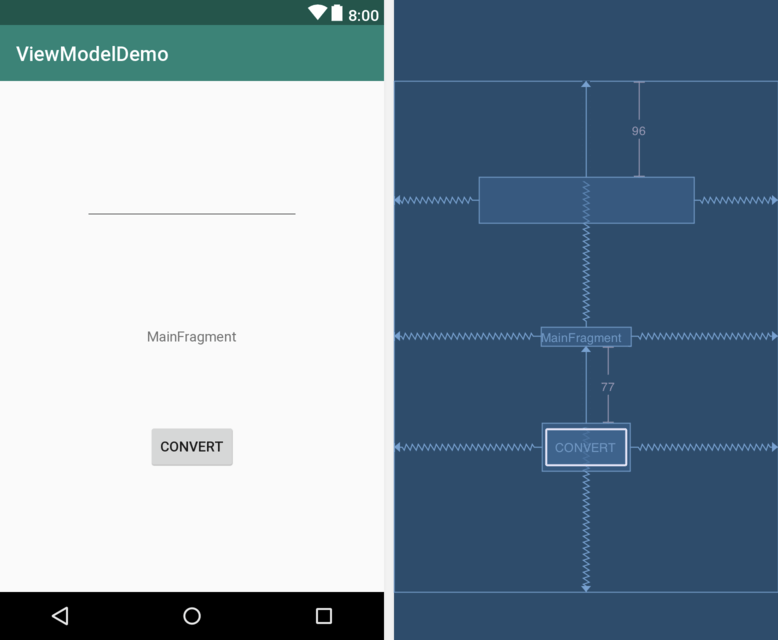 In this chapter we revisited the AndroidSample project created earlier in the book and created a new version of the project structured to comply with the Android Jetpack architectural guidelines. The chapter outlined the structure of the Fragment + ViewModel project template and explained the concept of basing an app on a single Activity using Fragments to present different screens within a single Activity layout. The example project also demonstrated the use of ViewModels to separate data handling from user interface related code. Finally, the chapter showed how the ViewModel approach avoids some of the problems of handling Fragment and Activity lifecycles. This page was last modified on 11 January 2019, at 18:27.